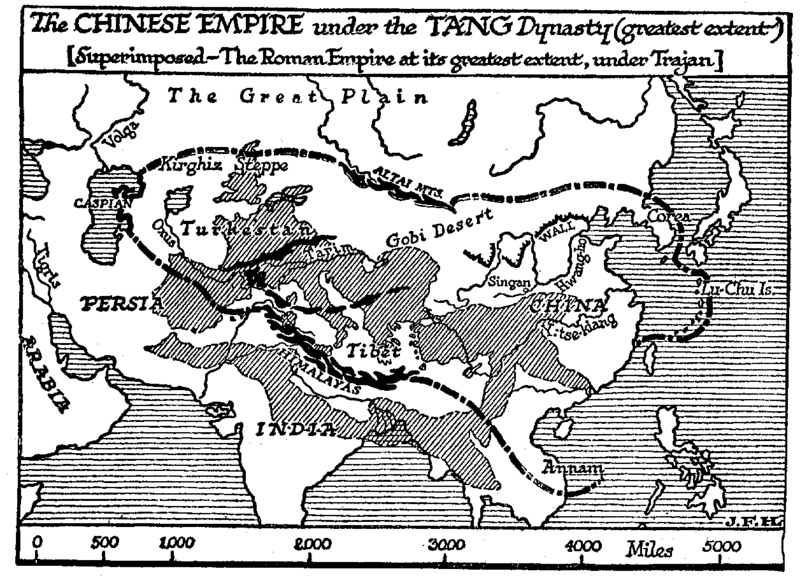 The Chinese Empire under the Tang dynasty, at its greatest extent. Superimposed: the Roman Empire at its greatest extent, under Trajan. These seven centuries which saw the beginning and the end of the emperors in Rome and the complete breakdown and recasting of the social, economic, political, and religious life of Western Europe, saw also very profound changes in the Chinese world. It is too commonly assumed by both Chinese, Japanese, and European historians, that the Han dynasty, under which we find China at the beginning of this period, and the Tang dynasty, with which it closed, were analogous ascendancies controlling a practically similar empire, and that the four centuries of division that elapsed between the end of the Han dynasty (220) and the beginning of the Tang period (619) were centuries of disturbance rather than essential change. The divisions of China are supposed to be merely political and territorial; and, deceived by the fact that at the close as at the commencement of these four centuries, China occupied much the same wide extent of Asia, and was still recognizably China, still with a common culture, a common script, and a common body of ideas, they ignore the very fundamental breaking down and reconstruction that went on, and the many parallelisms to the European experience that China displayed. It is true that the social collapse was never so complete in the Chinese as in the European world. There remained throughout the whole period considerable areas in which the elaboration of the arts of life could go on. There was no such complete deterioration in cleanliness, decoration, artistic and literary production as we have to record in the West, and no such abandonment of any search for grace and pleasure. We note, for instance, that «tea» appeared in the world, and its use spread throughout China. China began to drink tea in the sixth century A.D. And there were Chinese poets to write delightfully about the effects of the first cup and the second cup and the third cup, and so on. China continued to produce beautiful paintings long after the fall of the Han rule. In the second, third, and fourth centuries some of the most lovely landscapes were painted that have ever been done by men. A considerable production of beautiful vases and carvings also continued. Fine building and decoration went on. Printing from wood blocks began about the same time as tea drinking, and with the seventh century came a remarkable revival of poetry. Certain differences between the great empires of the East and West were all in favour of the stability of the former. China had no general coinage. The cash and credit system of the Western world, at once efficient and dangerous, had not strained her economic life. Not that the monetary idea was, unknown. For small transactions the various provinces, were using perforated zinc and brass «cash», but for larger there was nothing but stamped ingots of silver. This great empire was still carrying on most of its business and a basis of barter like that which prevailed in Babylon in the days of the Aramean merchants. And so it continued to do to the dawn of the twentieth century. We have seen how under the Roman republic economic and social order was destroyed by the too great fluidity of property that money brought about. Money became abstract, and lost touch with the real values it was supposed to represent. Individuals and communities got preposterously into debt, and the world was saddled by a class of rich men who were creditors, men who did not handle and administer any real wealth, but who had the power to call up money. No such development of «finance» occurred in China. Wealth in China remained real and visible. And China had no need for any Licinian law, nor for a Tiberius Gracchus. The idea of property in China did not extend far beyond tangible things. There was no «labour» slavery, no gang servitude. The occupier and user of the land was in most instances practically the owner of it, subject to a land tax. There was a certain amount of small scale landlordism, but no great estates. Landless men worked for wages paid mostly in kind–as they were in ancient Babylon. These things made for stability and the geographical form of China for unity; nevertheless, the vigour of the Han dynasty declined, and when at last at the close of the second century A.D. the world catastrophe of the great pestilence struck the system the same pestilence that inaugurated a century of confusion in the Roman empire, the dynasty fell like a rotten tree before a gale. And the same tendency to break up into a number of warring states, and the same eruption of barbaric rulers, was displayed in East and West alike. In China, as in the Western empire, faith had decayed. Mr. Fu ascribes much of the political nervelessness of China in this period to Epicureanism, arising, he thinks, out of the sceptical individualism of Lao Tse. This phase of division is known as the «Three Kingdom Period». The fourth century saw a dynasty of more or less civilized Hung established as rulers in the province of Shen-si. This Hunnish kingdom included not merely the north of China, but great areas of Siberia; its dynasty absorbed the Chinese civilization, and its influence carried Chinese trade and knowledge to the Arctic Circle. Mr. Fu compares this Siberian monarchy to the empire of Charlemagne in Europe; it was the barbarian becoming «Chinized» as Charlemagne was a barbarian becoming Romanized. Out of a fusion of these Siberian with native north Chinese elements arose the Suy dynasty, which conquered the south. This Suy dynasty marks the beginning of a renascence of China. Under a Suy monarch the Lu-chu isles were annexed to China, and there was a phase of great literary activity. The number of volumes at this time in the imperial library was increased, we are told, to 54,000. The dawn of the seventh century saw the beginning of the great Tang dynasty, which was to endure for three centuries. The renascence of China that began with Suy and culminated in Tang was, Mr. Fu insists, a real new birth. «The spirit», he writes, «was a new one; it marked the Tang civilization with entirely distinctive features. Four main factors had been brought together and fused: (1) Chinese liberal culture; (2) Chinese classicism; (3) Indian Buddhism; and (4) Northern bravery. A new China had come into being. The provincial system, the central administration, and the military organization of the Tang dynasty were quite different from those of their predecessors. The arts had been much influenced and revivified by Indian and Central Asiatic influences. The literature was no mere continuation of the old; it was a now production. The religious and philosophical schools of Buddhism were fresh features. It was a period of substantial change. «It may be interesting to compare this making of China with the fate of the Roman Empire in her later days. As the Roman world was divided into the eastern and western halves, so was the Chinese world into the southern and the northern. The barbarians in the case of Rome and in the case of China made similar invasions. They established dominions of a similar sort. Charlemagne’s empire corresponded to that of the Siberian dynasty (Later Wei), the temporary recovery of the Western empire by Justinian corresponded to the temporary recovery of the north by Liu Yu. The Byzantine line corresponded to the southern dynasties. But from this point the two worlds diverged. China recovered her unity; Europe has still to do so». The dominions of the emperor, Tai-tsung (627), the second Tang monarch, extended southward into Annam and westward to the Caspian Sea. His southern frontier in that direction marched with that of Persia. His northern ran along the Altai from the Kirghis steppe, north of the desert of Gobi. But it did not include Korea, which was conquered and made tributary by his son. This Tang dynasty civilized and incorporated into the Chinese race the whole of the southward population, and just as the Chinese of the north call themselves the «men of Han», so the Chinese of the south call themselves the «men of Tang». The law was codified, the literary examination system was revised, and a complete and accurate edition of all the Chinese classics was produced. To, the court of Tai-tsung came an embassy from Byzantium, and, what is more significant, from Persia came a company of Nestorian missionaries (635). These latter Tai-tsung received with great respect; he heard them state the chief articles of their creed, and ordered the Christian scriptures to be translated into Chinese for his further examination. In 638 he announced that he found the new religion entirely satisfactory, and that it might be preached within the empire. He also allowed the building of a church and the foundation of a monastery. A still more remarkable embassy also came to the court of Tai-tsung in the year 628, five years earlier than the Nestorians. This was a party of Arabs, who came by sea to Canton in a trading vessel from Yanbu, the port of Medina in Arabia. (Incidentally it is interesting to know that there were such vessels engaged in an east and west trade at this time.) These Arabs had been sent by that Muhammad we have already mentioned, who styled himself «The Prophet of God», and the message they brought to Tai-tsung was probably identical with the summons which was sent in the same year to the Byzantine emperor Heraclius and to Kavadh in Ctesiphon. But the Chinese monarch neither neglected the message as Heraclius did, nor insulted the envoys after the fashion of the parricide Kavadh. He received them well, expressed great interest in their theological views, and assisted them, it is said, to build a mosque for the Arab traders in Canton–a mosque which survives to this day. It is one of the oldest mosques in the world. There were girl slaves who did domestic work and women who were bought and sold. —J. J. L. D.